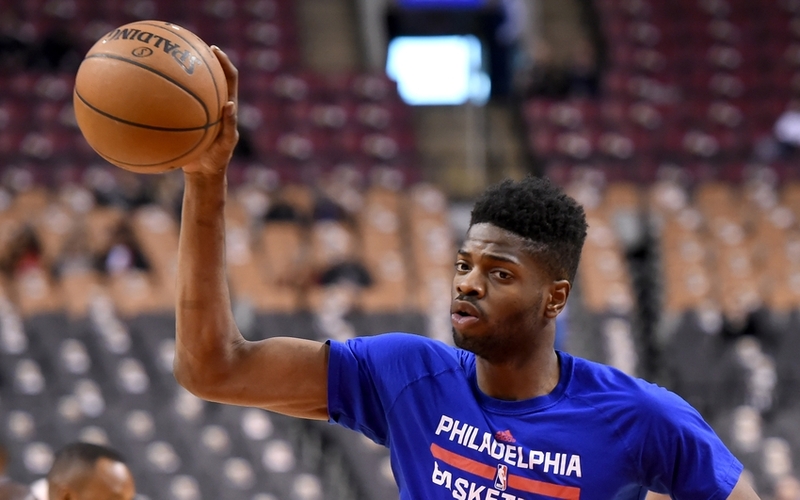 Toronto Raptors Rumors: The Raptors have reportedly discussed the possibility to trading for Nerlens Noel from the Philadelphia 76ers. Toronto Raptors rumors have picked up in recent days. With the injury to Jared Sullinger, the Raptors are in the market for some frontcourt help. Sullinger was expected to help fill the void left by Bismack Biyombo moving on as a free agent. Biyombo signed a four-year, $72 million deal with the Orlando Magic as a free agent. The Raptors were never going to match that, as they already have their center in Jonas Valanciunas. But, depth was still needed so Sullinger was signed to a one-year, $5,628,000 deal. The deal looked to be a good one for the Raptors, but Sullinger is expected to be sidelined nearly two months with a foot injury. With him sidelined the Raptors have little proven depth beyond Valanciuas and veteran Patrick Patterson. As a result, the Raptors have inquired about possibly trading for Nerlens Noel from the Philadelphia 76ers. According to ESPN’s Marc Stein, the Raptors are one of a couple of teams that have checked in on the availability of Noel. Noel would bring a lot of the same qualities to the Raptors that they lost with Biyombo leaving. Noel is defensive-minded much like Biyombo, averaging 1.7 blocks and 1.8 steals per game thus far in his career. He would also help on the glass, as he averages 8.1 rebounds per game for his career as well. 11/15 – Atlanta Hawks: Are The Hawks The Second-Best Team In The Eastern Conference? The only problem is that Noel is also sidelined. He underwent surgery minor surgery on his knee late in October and has yet to take the court this season. Once he is ready to return, though, he may not be long for Philadelphia. The 76ers have a logjam in their frontcourt. Joel Embiid has been great in the first NBA action of his career, finally debuting this season after missing two seasons with foot problems. The 76ers also have Jahlil Okafor, almost guaranteeing at least one being moved. Embiid looks like the best of the bunch and will more than likely stick around. That leaves Noel and Okafor as the two trade chips, with the more athletic Noel being the player teams are asking about. This is not the first time that the Raptors have checked in on trading for Noel. Over the summer, the Philadelphia Inquirer said that the Raptors and 76ers discussed a trade centered around small forward/shooting guard Terrence Ross and Noel. The 76ers ended up adding some veterans to the mix in free agency in the backcourt, so the need for Ross was lessened. But, they could really use his three-point shooting prowess. The 76ers are shooting 35.2 percent from the three-point line, but that is buoyed by an unsustainable 58.3 percent by Embiid and 47.8 percent from fellow rookie Dario Saric; Saric shot only 34.4 percent from deep in Europe. Ross is a 37.6 percent three-point shooter in his career and would help give the 76ers more spacing when Okafor is on the court. As for the Raptors, Noel would help fill a void they currently have on their roster. They are currently getting good production from Lucas Nogueira, who is averaging 8.3 points, 7.3 rebounds, 2.5 blocks, and 1.8 steals in four games played, averaging 25.8 minutes per game. The Raptors are also relying on rookie Pascal Siakam. He is averaging only 17 minutes per game, starting all nine games this season. He is providing relatively empty numbers with a PER of only 11.3. A trade for Noel isn’t close, but he would probably bolster the Raptors on the inside. He would be an upgrade over Siakam and give the Raptors more insurance in case Nogueira cannot sustain his production.